Acoustic guitars have a certain quality about them that’s hard to replicate with other instruments. Even an electric guitar on a clean setting or a synthesizer can fail to produce the authentic sound of an acoustic guitar. And yes, even those that use top-of-the-line technology. Thus the need for acoustic amps. However, there are a lot of brands to choose from, so it is important to know what to look for. There are many reasons for this. The body shape of an acoustic guitar coupled with the wood produces a unique sound and resonance. Add in that small, sometimes invisible to the naked eye, cracks in the wood can also boost resonance and sustain. Also, it’s easy to see why people love the acoustic guitar. It has been one of the most popular stringed instruments across various music genres for decades. When one put up an acoustic guitar against a studio full of electric amplified instruments, it can be drowned out. Luckily, there are acoustic amps helping “flat top” enthusiasts get the best of both authentic reverberation and appropriate volume. Here’s a little information about acoustic amps, their design, and which features to look for when buying. Why Should You Consider Acoustic Amps? Sometimes, the roar of an electric guitar leaves a lot to be desired. It is because the timbre just isn’t the same as an acoustic. You can use this type of sound quality for both rhythm and lead parts across many different musical styles. Acoustic amps seem like an oxymoron for some. Acoustic means unplugged, right? Image: CC0 by Public Domain, FirmBee, via Pixabay. ​Acoustic guitars generate their sound from reverberation through strategic wood selection and body design. Also, many of them have electric capabilities as well. Some acoustic guitars come complete with pickups and/or mics installed in them. It’s possible to find pickups that can you can place in the sound hole of an acoustic guitar.Or if all else fails, you can buy a microphone and play your guitar in front of it. 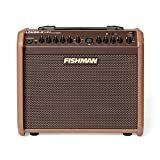 The advantage to using an acoustic guitar amp is that it’s designed for the specific instrument type. It means the sound frequencies acoustic players love will be able to come through the speaker with detailed clarity.You should consider an acoustic amp if you want to mix an unmistakable sound quality with higher volume levels. But more specifically, you should consider it if you want to boost the sound without compromising the unique quality.We suggest getting an acoustic amp with the right features. Whether you’re getting over the roar of a crowd at a gig or over the drums during a studio session. Reproducing the sound quality of an acoustic guitar at higher volumes requires a powerful pickup or microphone. Most acoustic guitar amp buying guides recommend choosing amps with one key feature – feedback control. ​Feedback suppression knobs can be your go-to solution when you hear unwanted hiss or screech ringing out through your amp. It’s an easy way to make adoring fans cover their ears or gigging pals recoil in shock – or pain. Mics feeding back through the amp produces a vicious cycle of high frequencies, taking sound quality down a few pegs. ​Suppression features work by using equalizers and compressors to route out the undesired sound while keeping the good frequencies. By compressing audio signals, it’s easy to group all sounds together and pack them down tight. ​That signal is then processed with an equalizer to help take out the high-end feedback. It’s the same system used to take out the high hiss from drum cymbals or the saliva clicks from vocalists. It’s possible to control feedback without EQ using a combination of distance and positioning in relation to the amp. ​But if you want to greatly simplify the process, opt for an amp with feedback control. You should also consider finding an amp that is set up for your preferred style of use. Planning on singing while playing your acoustic guitar? Consider an amp that can process both signals and control each separately. Plug in your mic or pickup, flip the on switch, choose your settings, and play. That’s the simple formula for using an amp. But some people want to sing while they play acoustic guitar. Others may want to play harmonica while they strum, or even control bass pedals or bass drums with their feet.That takes a lot of talent and focus – but it also takes a proper mic setup. A PA system is usually the first thing people think about when they need multiple microphones for their musical setup.But some acoustic amps feature dual channels, allowing you to plug in two inputs and apply different settings to each. This could be a quarter input and an XRL, two quarters, or two XLRs. Sometimes, your perfect amp doesn’t have the right dual-channel input selections for your needs. You may therefore remember there are adapters and converters to help you make it work.Dual-channel amps allow you to set your own volume and EQ levels for each. Do you have a quieter voice that needs to boom over your rumbling acoustic guitar? Are you looking to cut down the 2K range on your guitar to minimize “tinny” sounds? But know doing that on your vocals will take some of the shine away? Choose a dual-channel amp and enjoy an all-purpose PA with a much simpler interface.Some people can get by with an acoustic amp on EQ and feedback controls alone. Others, however, want to add a little something extra to their sound. This usually comes in the form of effects. Some may choose to lug a train of pedals and stomp boxes around. While some musicians opt for the simple solution of choosing acoustic amps with built-in effects. When you hear an acoustic guitar ring out, do you desire to accentuate that resonance with a bit of reverb?What about producing an echo effect using a delay feature? If you have these effects in your pedalboard, you have nothing to worry about. But if you don’t, you still don’t have to worry – because you can get them in the amp. Amps come with various effects like reverb, delay, chorus, flanger, and compression.Using a combination of effects can help you accentuate the natural frequencies of your acoustic guitar can offer big results. This is true, especially at small levels. It can enhance the sound and give that extra bit of glimmer and polish to captivate your audience. Even if your audience is yourself.There’s also the option of finding amps with a loop effect. If you’re the only guitarist on stage, you may need to provide the rhythm and lead parts at the same time. This also works even if you’re a one-person show. Not up for the challenge of transposing or finding new voicings to play both parts together in real-time? You can record your rhythm track and loop it back, giving yourself access to appropriate harmony to complete your song. How Big Should Your Acoustic Amp Be? Size matters, but watts matter more when it comes to amplification. If you’re playing in a massive stadium or arena, you’ll need more power than you would for a studio recording.The 20W-40W range for acoustic amps is usually perfect for small needs.Are you wanting something to power your acoustic guitar when you’re practicing at home? Jamming with a small group of friends, or even gigging at a quaint venue like a coffee shop?Go for amps in this range to make sure you don’t pay for more than what you need. Let’s say the gig is a little bigger. Maybe you’re playing in a gymnasium, a decent-sized church, or even to an outdoor crowd of a few hundred people? Image: CC0 by Public Domain, Pexels, via Pixabay. Find yourself an amp in the 40W-100W range. It should have plenty of power to push your playing as far as you need without degrading sound quality.For big shows and huge areas, you may want to look into amps with 100W-300W range or even higher. You could even opt for separate speaker cabinets, letting the amp itself function as the head.